I have anxiety issues associated with going to sleep alone and sweet fairy tales told by Natasha gives me a friendly voice right there in the room to take the fear away. I first heard of storynory from my Google home when I asked for a bedtime story. After listening to a bunch of them I had to buy the app! Ellie loves the stories. Every night we tell Alexa to turn off the light and listen to another amazing storynory. We’ve done all fairytales, 1001 nights and were enjoying the awaking beauty. Love the stories. 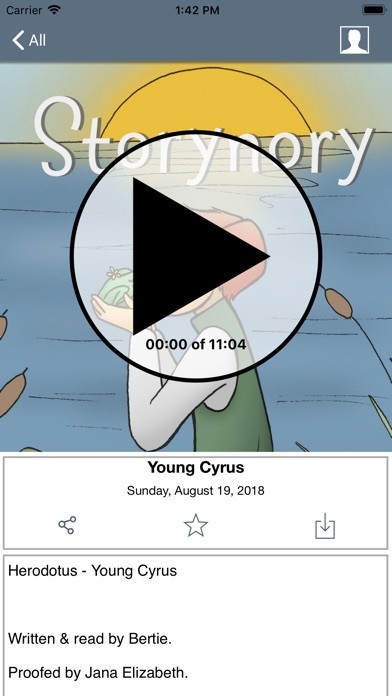 Storynory is brilliant! Amazing original story series such as Katie the Witch and Astropup. Great classics, too. Our whole family listens to this every night and has for years. This is a wonderful app. My daughter enjoys all the stories and can't wait for more. My daughter loves story nory. This app works just fine for accessing the latest stories from their website and is great for trips. 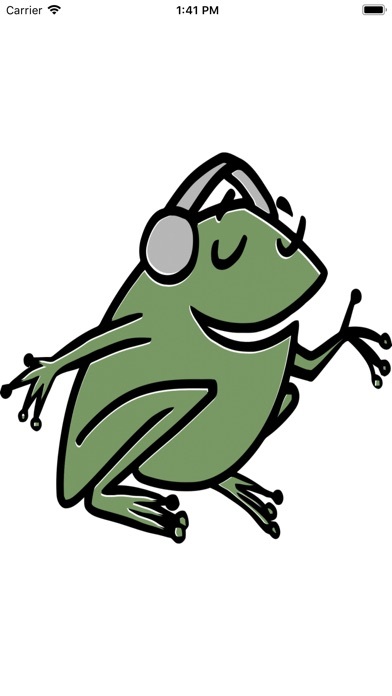 If you're using an ipod touch or want a free alternative, subscribe to their podcast and download episodes to save for later. Nothing different from the free subscription!! My 6yo goes to sleep with no issues anymore. He loves to snuggle in and play a few stories while falling asleep. The only request is that you add a few lighter stories. Some are a bit scary in the evening especially since you can't cue them up and choose a few to play after I leave the room. One helpful hint for the developers. It is very hard to find this app unless you are looking for it specifically. You don't come up for kids or children's audiobooks or audio. This is the only app I've ever rated. It is wonderful. They are always making improvements on it. It's lovely. I recommend it wholeheartedly! 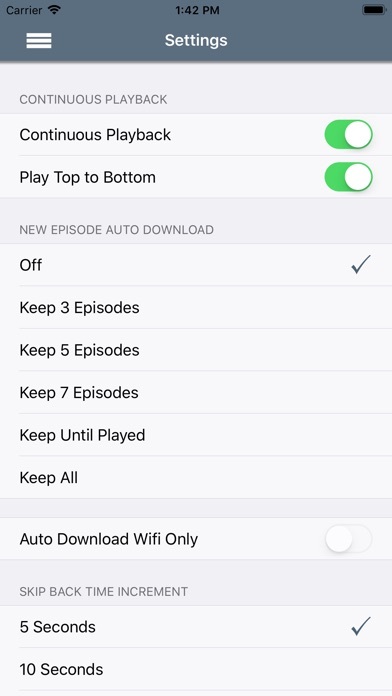 Works fine for me and I like the convenience of getting the podcast right on my iPhone without having to sync. Lots of stories. Both my 3 and 5 yr old love it. 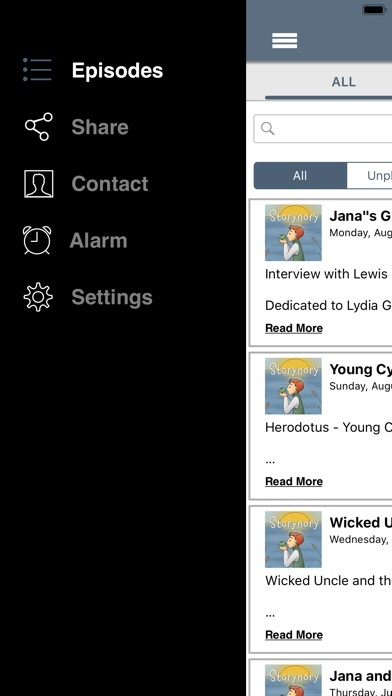 We love storynory, but the I pod app is terribly buggy and crashes all the time. Please please fix these bugs-- we would really prefer to use the app if it worked correctly. I really like this app. One thing I'd like to see is stories place in categories like on the website. It's fun to listen to all the Bertie stories. I'd also like to play all all the chapters in order of the books. My students love listening! The stories are too mature for my 4 year old. There are not very many either. I missed read or misunderstood but yes this is completely audio only and no pics. I will try it since I paid for it, but I do not think my 3 and 6 year old will not like it since there are no pictures to go along with the story. Very dissatisfied. My girls and I enjoy Storynory. 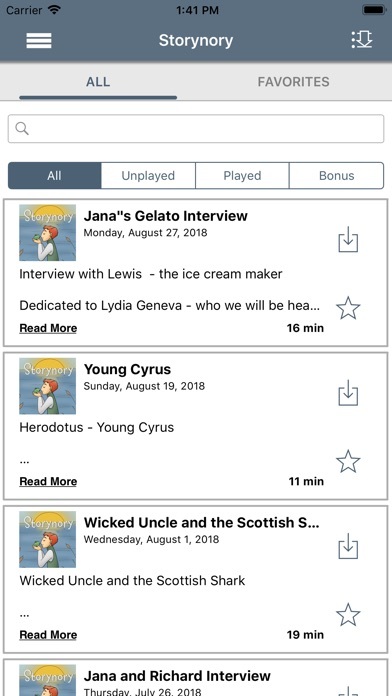 This app lets us download stories that are not available on podcasts. I wish there were more stories though. Not all the stories that are on the website are on this app.